MOSCOW. Sept 18 (Interfax) – The Ilyushin Il-20 incident could have been avoided had Israel and Russia had efficient channels of military communication, according to Alexei Arbatov, the head of the International Security Center at the Russian Institute of World Economy and International Relations. “Improving interaction and mutual notification will be necessary, because if we had known in advance that Israel would carry out such a strike, our aircraft would have chosen a different route or a different time to avoid friendly fire,” Arbatov told Interfax on Tuesday. The main disagreements between Israel and Russia on Syria have to do with Iran and Hezbollah, he said. 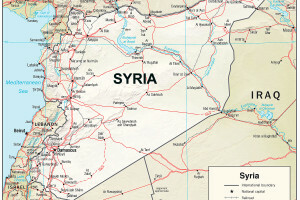 “Russia, Iran, and Hezbollah are operating together in Syria alongside the Syrian government. Israel sees Iran as its enemy and Hezbollah as a terrorist organization. It did and will carry out strikes, especially in the zone abutting its borders, the zone from which Israel could be attacked,” Arbatov said. The intentional nature of Israel’s airstrikes will be hard to prove, he said. “Israel will not reply definitively that it used this aircraft as a cover. That won’t be easy to prove,” Arbatov said.